Sorry, the R2-D2 can’t help you do all sorts of things, but if you need a unique way to hold junk at home, the Star Wars R2-D2 trash can may be able to catch your eyes. This is an officially licensed trash can themed by Star Wars, the epic sci-fi franchise by George Lucas. As we can see from the images, the trashcan is shaped as R2-D2, one of the most famous droids in the universe of Star Wars, and features exquisite details and accurate colors from its original design. 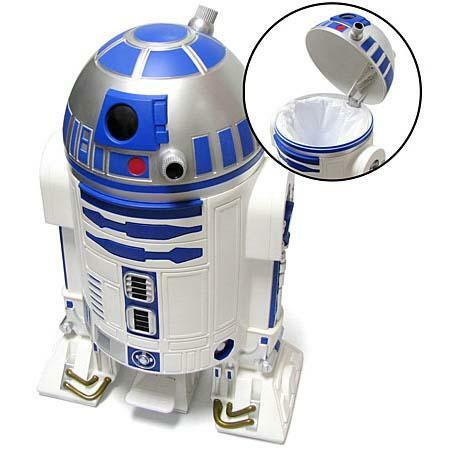 Moreover, the R2-D2 trashcan is made of vinyl for durability, and comes with a removable interior can win handle in order that you can easily remove trash from the droid. Apart from that, the R2-D2 trashcan measures 23.5 x 16 inches, the wastebin inside is about 11 inches tall. The Star Wars R2-D2 trash can is priced at $129.99 USD. If you’re interested, jump to ThinkGeek for more details. Additionally, If you need other options you might like to check the TARDIS trash can and more via “trash can” tag.